Our story begins some 65 million years ago, just after the dinosaurs perished and the age of mammals began. Hurtling at each other at a “whooping”, one inch per year, the Americas were still separated by a marine connection between the Pacific and Atlantic Oceans. Before they eventually came together, these continents were completely isolated from any other landmasses and evolved totally unique species of plants and animals, found nowhere else on Earth; similar to how Australia is today. Their inevitable “collision”, some 3 million years ago, actually had massive biological repercussions, by causing the greatest episodes of biological migration in Earth’s history. This is what is known today as “The Great American Biotic Interchange”. Huge and diverse animals began to migrate north and south, together with plants, fish and all sorts of birds. We won’t be able to cover most of these, but here are 10 such mega beasts which saw firsthand what connecting two previously isolated continents can bring. This mighty creature has its origins in South America. Evolving on this tropical continent, the Megatherium (“giant beast” in Latin) was the largest ground sloth to walk the planet. Measuring at about 20 feet long, it weighed more than 4 tons and could reach up to 13 feet into the air. Its bone structure indicates that this elephant-like creature was perfectly suited to standing upright, foraging high in the upper vegetation, as well as for walking long distances. It mostly adopted a quadruped posture when resting or digging for roots. Some scientists also believe that, even though mostly a plant-eater, Megatherium was an occasional scavenger, sometimes even driving off predators from their kills. Nevertheless, its jaw and teeth structure indicate a high capability of chewing tough vegetation, and a great adaptability to a large variety of plants. This versatility was also one of the main reasons for why this Giant Ground Sloth was so prolific in its new environment of North America. And due to its large size, as well as a series of little bones beneath its skin which acted like chainmail, no predator at the time could pose any real threat. Adults were more or less invulnerable, just like the Mammoths living there at the time. This was great news for the Megatherium as it wasn’t going to break any speed records anytime soon, and was quite possibly the slowest mammal in its ecosystem. It nevertheless went extinct around the start of the Hologene period, some 10,000 years ago, but it was among the last of the mega-animals to do so. Some believe that climate change was the cause for their demise, while others blame disease, but the strongest evidence points to humans, which also made their presence felt in the region about the same time. Since early humans could attack it from a distance with spears and such, the Megatherium, with its incredibly slow speeds, finally found its match. Contrary to popular belief, there have been many different species of saber-toothed cats that have lived across the Western Hemisphere. But without a doubt, Smilodon “knife-tooth” was the largest. Weighing in at around 660 pounds, it quickly became top predator throughout the southern continent, once species began to traverse between the two. Originally from North America, Smilodon was the first ever feline to set foot in South America and, with relative ease, was able to top the fearsome terror-bird Phorusrhacos, which previously ruled the land. It could grow as big as 7.4 feet long and it would have most likely lived in packs, similar to how lions do today. Others have speculated that Smilodon may have also lived a solitary life and mostly spend its time in trees, jumping on its unaware prey from above. This may have been a possible scenario for one of its subspecies, the S. gracilis, but due to its large size, our fearsome beast was most likely a land dweller. Moreover, fossil records show such saber-tooth cats outliving wounds which, for a solitary predator to survive, would have taken too long to heal. Their 11 inch long canines may have looked pretty intimidating, but they were somewhat fragile and often put in risky situations. However, their jaws could open at twice the angle of most other mammals, which made it a truly life-saving adaptation for the sabre-tooth. With these sharp “blades”, a saber-tooth was able to stab its prey in the throat and slice its vital arteries in one precise swoop, killing it almost instantaneously. According to isotope markers found in their bones, Smilodons living in North America preferred the taste of bison above all. What made it go extinct some 12,000 years ago, during the Quaternary extinction, is still a matter of debate among scholars. However, recent discoveries point to the fact that it wasn’t the lack of food that did it in, but more probable was the case of an infectious virus of some sort. Nevertheless, its legacy can still be seen today, especially in South America, where felines like the Puma and Jaguar are all Smilodon’s successors. Bigger than the average town car, Doedicurus was the largest member of the Glyptodonts; armored herbivores, related to modern day armadillos. These mighty creatures measured 13 feet long, were heavily plated with a tough, bone outer-shell and were packing a 6 foot long armored tail with an 88 pound spiked “cannon ball” at its tip. As herbivores, the Doedicurus mostly used their deadly weapons on each other to batter rivals into submission during hormone-fueled jousts for a mate. Nevertheless, it also came in handy when a predator, foolish enough, tried to take it down. If such an attack was imminent, they most likely would have clustered together, side by side, sweeping their tails in unison to create an intimidating living wall of armor and swinging clubs. These, otherwise docile “tanks”, did take part in the Great American Biotic Interchange, as many fossils have been found throughout North America; mostly in Mexico, Arizona, Florida, New Mexico, Oklahoma and Texas. According to a DNA analysis, it seems that all Glyptodonts, Doedicurus included, probably separated from the last common ancestor they shared with armadillos about 35 million years ago. Since then, they grew exponentially in size and their protective carapace adjusted accordingly, becoming hard and unarticulated as a result. Nevertheless, they too went extinct about 11,000 years ago with the most probable culprit being early man. While its defenses may have proven too much for most predators, human hunters could use their intelligence to identify weak and vulnerable areas of the body and then use specially crafted tools to strike at them. Besides their meat, Glyptodonts were also highly prized by humans as its carapace could easily be used as a form of shelter. Thanks to a meteor that wiped off T-Rex and most other dinosaurs, the age of the bird as number one predator in South America, began. And their reign even lasted for more than 60 million years. While the saber-tooth cats, bears and wolves were among the top killing machines on the northern continent, here in South America, mammals were mostly happy herbivores. The position for “top of the food chain” was reserved for terror-birds such as Phorusrhacos, unrivaled in their ecosystem. Think of a Velociraptor, but with feathers and a beak the size and relative shape of a pickaxe, and you have a terror-bird. Since all birds are in fact the direct descendants of dinosaurs, one can say that South America never truly witnessed the end of the dinosaur age, but just an altered form of it. Standing at 8 feet tall, Phorusrhacos would usually take its prey by surprise and in one precise swoop, smack it right on the back of the head with its pickaxe-like beak, and with enough force to bring down even a fully-sized horse. With a broken neck and perforated skull, the unaware victim would have died instantly. All small to medium sized mammals would have cowered away in fear at the site of one of these absolute birds of prey. With no real wings to speak of, Phorusrhacos relied heavily on its extremely long and powerful legs to chase down its kill and move around. It’s very likely they also used their long, sharp claws on their feet to stab at their victims. Phorusrhacos mostly lived on grasslands and in open woodland areas, preferring to stick close to the taller underbrush as to hide its figure from any potential targets. Once the great intermingling of the species began, these terror-birds took second place in favor of the saber-tooth and bears that roamed in from the north. They were quick to adapt however, and began acting as partial scavengers; like modern vultures in present-day Africa. They nevertheless went extinct some 2.7 million years ago, but were able to cross into North America. The closest living relative of these once top predators is the 30 inch long, Seriema bird, living in Brazil, Bolivia, Argentina, Paraguay and Uruguay. Together with its South American cousin, the Arctotherium, these two short-faced bears were the largest ever carnivorous land mammals to have ever walked the Earth. Originally from North America, these bears began migrating south once the two continents collided, following their prey into the new world. Other species of bear existed around the world at the time, including in North America itself, but none came close to this one. And unlike other bears, Arctodus was the only one whose diet was exclusively meat-based, being dubbed as a hyper-carnivore. At 6 feet tall when on all fours, Arctodus was a monster in the truest form of the word. Rising some 11 feet on its hind legs, it towered over any other predator and could even tackle and kill a Megatherium. However, its skeleton tells a different story. Relative to its immense size, its legs were surprisingly long and slender. While this was a great advantage in chasing prey at speeds close to 31 Mph, enough to compete with pretty much anything, its bones could not withstand the shocks when turning a tight corner. This strongly indicates that Arctodus was not so much a hunter but rather more of a scavenger. Many other clues also point in this direction. Firstly are the isotope markers found in its bones which indicate that the short-faced bear ate all kinds of meat and didn’t specialize on any one type of prey. This is highly unusual for a predator, but common for a scavenger. Secondly, it had an extremely powerful nose. While normal bears today are considered to have the best sense of smell of any animal on Earth (2,100 times better than a human), Arctodus was even better. It could sense a fresh kill or carcass from up to 6 miles away and quickly run for it. Its short snout was also perfectly suited for breaking apart hard bone and eating the nutritious marrow inside; something which scavengers mostly do. Lastly was its sheer size. When it came to available prey, 2,500 pounds of mass is overkill, but if put against a pack of dire wolves or Smilodons, things begin to make sense. While the title of scavenger isn’t as catchy as top predator, an Arctodus could dispatch any opposition from their kill with relative ease, and thus have the predators do all the hunting for him. With its oldest discovered fossils dating back some 7 million years, this unusual herbivore endured as late as the end of the Pleistocene, some 10,000 years ago. Even before the South American continent split from Antarctica around 30 million years ago, it gave birth to some truly unique creatures, found nowhere else on Earth. One such beast was the Macrauchenia, a 10 foot long by 8 feet tall herbivore which lived in large herds, all across the grasslands and open forests of South America. Today, no living relatives of the Macrauchenia exist, and were one of the few members of Litopterns to survive the Great American Interchange, as well as the last to go extinct at the beginning of the Holocene epoch. This 2,300 pound animal was a true oddity of nature, “borrowing” features from other species of mammal with no relation, and morphing into a sort of “Jack of all trades”. For starters, its long front legs resembled those of a camel, giving Macrauchenia the ability to run at great speeds. Its rear legs however, were the exact opposite and looked more like those of a present-day rhinoceros. These indicate that instead of sprinting, Macrauchenia opted for greater maneuverability and probably lived in more difficult terrain, hazardous for fast running predators like the fierce terror-birds. Its strange skull indicates a small trunk present, or a well-developed prehensile lip that grew from the tip of the snout like on a tapir or elephant. Probably more similar in shape to that of the present-day Saiga Tatarica, its trunk was used for stripping leaves from shrubs and low growing trees. Its teeth on the other hand, were showing this herbivore chewing on grasses. This larger food diversity most likely offered the Macrauchenia its broad geographic distribution of remains throughout much of South America. Since no fossils have ever been found across the Isthmus of Panama, it’s safe to say that these herds never migrated onto the newly attached continent. Its northern counterparts however did, like the camel and the horse, and which brought their own set of fearsome predators with them. With new competition for grazing lands, as well as the many Smilodons and Dire Wolves that followed, Macrauchenia began to dwindle in numbers, but slowly, over the next 3 million years. Together with a series of sudden climatic changes which gripped the region some 10,000 years ago, these unique creatures which once littered most of the continent, were forever gone. 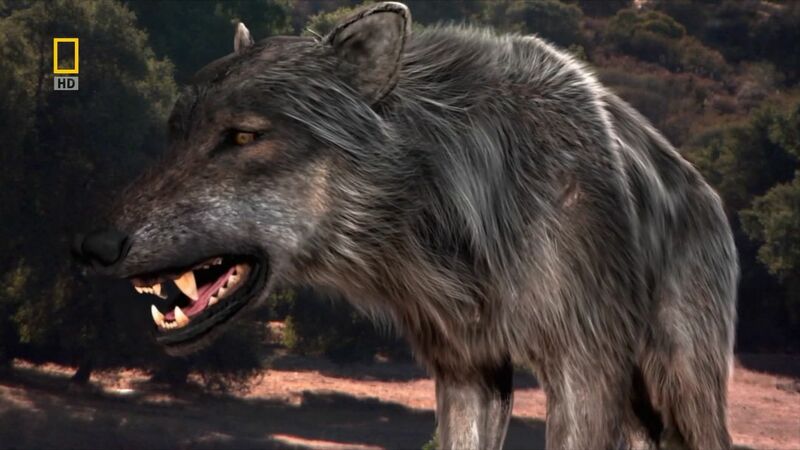 Hunting in packs of over 30 individuals, the dire wolf was not only the largest wolf to have ever walk the Earth, but also a fierce, powerful and tenacious predator which evolved in North America and which later crossed south, following its prey over the newly-formed land bridge. Nevertheless, in a geological instant, this swift killing machine went extinct, passing its spot within the food chain to its smaller cousin, the present-day Gray Wolf. For a period of over 100,000 years, both these species coexisted and are most possibly descendants of Armbruster’s wolf (Canis armbrusteri). Since the dire wolf was somewhat larger and more powerfully built that its gray cousin, they focused on different types of prey, and didn’t have to compete with each other all that much. Fossil records, discovered at the La brea Tar Pits in Los Angeles, as well as other parts of the US, indicate that Dire Wolves were hunting mostly bison and horses, while the Gray wolf was more into elk and deer. Nevertheless, they often times came in contact with Smilodons, not to mention short-faced bears, and thus had to kill and eat their prey fast, so no other meat-eaters could chase them off from their hard-earned meal. The abundance of fossil records found in these tar pits indicate that many dire wolves suffered various injuries while hunting or fighting with other predators, but nevertheless, surviving many years after. They also show teeth marks made by other wolves, which seem to indicate a strict hierarchy within the pack; similar to present-day wolves. Whatever caused their demise is still a matter of debate among paleontologists. Rapid climate change is among the culprits, as well as a comet exploding over the continent. Early humans were also present at the time, which are believed to have brought new strains of bacteria and disease with them, to which North American animals had no natural resistance against. But since the grey wolf survived, it’s safer to say that the Dire Wolf’s favorite prey dropped swiftly in numbers, leading to them going extinct, while their smaller cousins, surviving. Contrary to popular belief, both the horse and camel evolved in North America some more than 40 million years ago. They since crossed the Bering land-bridge onto Asia around 7 to 4 million years ago, spread across the “Old World”, only to later go extinct on their home continent. The last camel to die off, which was also the largest, disappeared somewhere around 9,000 BC. Towering at 8.5 feet from the ground, the Camelops (camel-face) was looking down at all the other 12 known genera of camels living in North America between 20 and 14 million years ago. During the Pleistocene however, only about five species of camel survived. Based solely on available fossil records, it’s hard to say if the Camelops had any humps on its back, similar to present-day camels and dromedaries. But according to the prominent neural spines which are similar to the dromedary, it is possible that Camelops may have had a one. Further archaeological evidence point to the fact that this camel was a generalist herbivore that fed upon whatever plants were available, giving it a wide range of dispersal. Since they crossed over onto South America when the two continents became connected, they later evolved into the present-day llamas, alpacas, guanacos and vicunas living there today, as a response to the new environment. Their eventual disappearance from North America is somehow linked to early man preying on them. Evidence of butchery and a processing of their carcasses for food have been found on some Camelops fossils from the time of their vanishing. But these don’t automatically account for the entire species’ extinction, and is possible that human hunting was only a contributing factor and not the main cause. Similar to most other megafauna living in the Americas, their sudden disappearance is still largely a mystery. Living mostly in present-day California, Nevada and New Mexico, Aiolornis was the largest flying bird to survive until the Great American Biotic Interchange, as well as to see humans roaming in from the north, some 12 thousand years ago. Though not the largest ever airborne bird to have lived on the planet, it had a 16 ft. wingspan, as compared to the present-day Andean Condor, which is only at about 10 ft. The largest such bird to have ever existed was the Argentavis (23 ft.), native to South America and which disappeared about 6 million years ago. According to fossil evidence, mostly from the La Brea Tar Pits in Los Angeles, the Aiolornis was later placed in another genus from the other large flying birds, the Teratorns, of which the mighty Argentavis was a part of. Nevertheless, their skeletal remains show that both these birds acted similarly in their environment. Reaching the maximum size and weight a feathered-bird can have without losing its flying capabilities, Aiolornis was more of a glider than anything else, relying on thermal up draughts to stay airborne, and had great difficulty in taking off from flat terrain. This is why they lived in sloped areas, where they “launched” either by running downhill or jumping off cliffs. When hunting, they most likely fed on small mammals, reptiles and other birds, by swooping close to the ground, snatching their prey, killing and eating them whole, without ever coming to a stop. As a fun fact, their feathers measured some 60 inches long by 8 inches wide. With no natural predators, these mega-birds laid only one or two eggs every 2 or so years. The chicks lived with their parents for up to 12 years, until they reached full maturity. Their lifespan was long, probably somewhere between 50-100 years, and died mostly of old age, accidents or disease. Since they lived long enough to encounter man on the North American continent, it is quite possible for Aiolornis incredibilis to be the inspiration for the Native American mythological creature, the Thunderbird. Together with the Megatherium, the Toxodon was the largest and most common, solitary herbivore to roam throughout South America during the Biotic Interchange, only going extinct about 11,000 years ago, during the last major Ice Age. No fossil remains have ever been found in North or Central America, but this doesn’t mean it never had to deal with the animals originating there. While terror-birds posed little threat to the Toxodon, the new arrivals from the north were another matter. At 9 feet long and weighing some 3,100 lbs, it could have been the desired meal for Smilodons, now living in the region. Similar in constitution and proportions to the present-day rhino, Toxodon walked with the flat of its foot so that it could better support its own weight. Its hind legs were longer that those in front, giving a forward-facing slope to its body, and allowing its hippo-sized head to better reach the low growing vegetation. Based on its skull shape, it is possible for the Toxodon to have had a prehensile lip, just like the Macrauchenia, also living there. It may have also presented itself with a fatty hump on its back, but just like with the prehensile lip, there is no way of knowing for sure. Some Toxodon remains were found alongside arrowheads, leading scientists to theorize an overkill hunting practice done by early humans on the existing megafauna, leading to their eventual extinction. The first to collect and analyze its fossils was none other than Charles Darwin himself, on his trips to South America, and describing it as “one of the strangest animals, ever discovered…”. Based on these findings, and the fact that they looked totally different from any European mammals, Darwin was able to invoke many debates about evolution and natural selection. Previous to Darwin, news of ancient fossils were reported by early Spanish explorers in the Americas. They however interpreted them as belonging to an ancestral race of giant humans, erased from the face of the Earth by some sort of divine intervention.